Born in southern Brazil, Adrianne used to cover her ears in the cacophonic musicalization classes in kindergarten. Nevertheless, she still got interested in music as a child, playing a toy keyboard and discovered astronomy with a Polyopticon kit telescope. At 14 years-old she got her first electric guitar, a Giannini Super-Sonic model, which she fondly keeps to these days. At 17, she found a violin in her aunt's old closet and decided to take it home to "dust it". 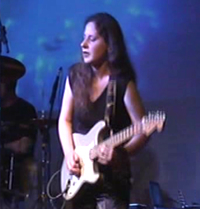 In the years she was studying Physics at Universidade Federal do Rio Grande do Sul, she put up a band called Aldebaran with a repertoire of original songs and covers having Astronomy as theme. Later she participated in the jazz-rock fusion group Dr. Divago, making her mind on the music career. In 1991, Adrianne and other musicians, among them Zozimo Rech, joined in Orquestra Profana, an ensemble dedicated to the interpretation of classical music with electronic instruments. Also by this time she was playing the violin in a chamber orquestra, SOMUSICA, performing solo violin occasionally, and was accompanying on guitar her violin teacher Nicolau Richter in Trio Staccato. In 1996, southern summer, she went to Uruguay to study with Maestro Jorge Risi in the Primer Curso Internacional de Violin de Montevideo. Also in this year, she took part in the group Kozmic Blues, headed by singer Flora Almeida. The following year she moved to Hollywood, USA, to perfect her skills at Musicians Institute- Guitar Institute of Technology. There she had the opportunity to play fiddle with country-rock singer Melissa Jackson. Back in Brazil in 1998, she recorded a live CD with Kozmic Blues. In 1999 she was invited to join another country-rock band, The Travellers, this time performing on the electric and acoustic guitars, the violin, as well as doing some backing vocals and percussion. With The Travellers she has recorded three albums by the local label Kives. In 2006, due to her lasting passion for instrumental music and astronomy, Adrianne publishes her first solo album in the Astronomusic project: The Intelligible Sky. Here she describes musically the evolution of the understanding of the skies from the times of superstitious primitive men sitting around the fire at night, moving on to the useful elaboration of calendars, the discovery of celestial mechanics laws (and the tortuous paths taken by its heroic protagonists),until a curious futuristic artistic extrapolation involving extraterrestrial points of view.